We’ve been sitting on this idea for some time now, and we figured that the relatively quiet week prior to the 2009 Final Four would be the best time to unveil it for your vetting, review and diligence. So the plan is this: each weekday we’ll advance one round until we get to a Modern Era Final Four on Friday. On Sunday following the F4, we’ll release our two finalists and the Modern Era champion will be crowned on this year’s Championship Monday. We selected the 24 national champions (noted in black). Finally, we selected the 16 best at-large teams of the last 24 years (noted in red). You’re undoubtedly wondering how we chose the last group of sixteen at-large teams, and that’s a fair question. There was no single measure (such as making the F4) that guaranteed inclusion to or exclusion from our at-large field, but we considered each team’s body of work in a particular season when doing so. Criteria such as overall record, conference record, AP poll ranking, NCAA seed, postseason success, general reputation at the time, and team history were included. Similar to selecting and seeding the field every year, the last few teams looked largely the same on paper and in our memories. Some of them will without question inspire debate, but that’s ok, because the point of this entire exercise is to do so. The same is true for how we seeded each team in the field. As much as possible, we tried to stay away from the Team A would beat Team B analysis (that’s next! ), focusing mostly on the team’s full body of work. Of course, comparing teams between eras and even years is nearly impossible in many cases, so there’s a fair amount of subjectiveness that went into the seed placements. Bear with us on that. Additionally, as much as possible, we tried to avoid early-round matchups between the same school and teams from the same season, while still keeping a reasonable amount of competitive balance among the regions. 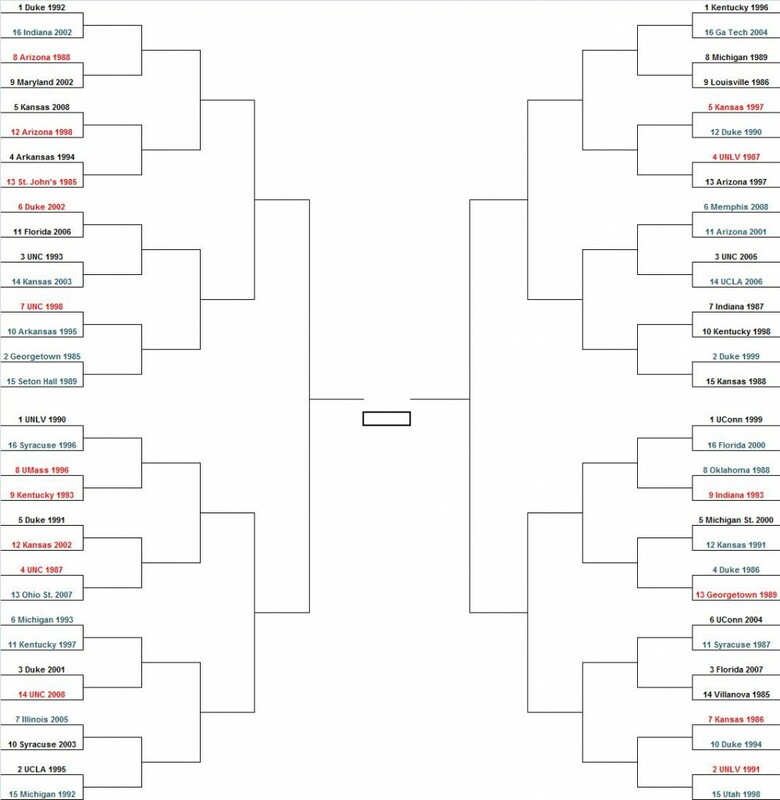 Enough chatter, here’s our Modern Era bracket. Please leave us comments below telling us your choices for the first round winners. We won’t guarantee that we’ll listen, but you’ll likely know something about these matchups that we don’t. Feel free, and we’ll be back tomorrow with the next round! Update: here are the First Round results. Be sure to check back on Tuesday morning for the First Round results of the RTC Modern Era bracket. This entry was posted on Monday, March 30th, 2009 at 1:02 am by rtmsf	and is filed under rtc modern bracket. Tagged: arizona, arkansas, connecticut, duke, florida, georgetown, georgia tech, illinois, indiana, kansas, kentucky, louisville, maryland, massachusetts, memphis, michigan, michigan st, ohio st, oklahoma, rtc modern era bracket, seton hall, st johns, syracuse, ucla, unc, unlv, utah, villanova. You can follow any responses to this entry through the RSS 2.0 feed. You can leave a response, or trackback from your own site. Duke 01 is only a 3 seed? Ouch. I mean, I know they didnt have the star NBA-studded lineup of the 99 team, but J-Will was freaking awesome enough the team might’ve been better when Boozer was healthy. Close call though. We seriously thought about keeping them as the last #2 seed (no way they crack the #1 line), but ended up giving it to 1995 UCLA (31-2 compared to Duke ’01 going 35-4). One small knock against Duke was that they didn’t exactly dominate a Maryland team that we didn’t even think was that good the following year. Any thoughts on the first round match-ups? I got a hard time on matchups. I started watching college bball really with Duke’s 99 season (My Brother’s first year there), so any years before then…i can’t really judge. Ok, a ton of Dukie bias in these brackets…86 Duke was an awesome team and deserve a 4 seed, but Louisville whipped them in the NC game and you have Louisville as a 9 seed. How do you give 97 Kansas a 5 seed and the team they lost to in the sweet 16 Arizona a 13 seed as a NC. 2002 Duke shouldnt have gotten an at large bid as a sweet 16 loser. How about 98 Stanford or 97 Minnesota or 04 Oklahoma State or 89 Illinois or 99/01 Michigan State for those at large bids. With that being said here are my teams to advance to the round of 32. 13. St. John’s wins a tough upset over 94 Arkansas. Walter Berry could shut down Corliss Williamson. 11. Florida wins easily over the highly overrated 92 Duke squad. 3. UNC 93 wins over Kansas 03. 8. UMass 96 avenges their final 4 loss by beating the 93 Kentucky Wildcats in a buzzer beater type game. 9. Louisville over 8. Michigan Never nervous Pervis and Milt Wagner over Glen Rice and co.
Syracuse gets screwed by the selection comity once again. Are you serious? How can the 2002 Maryland national championship team be a #9 seed & play an at large Arizona team?? Maybe you guys should stop buying Bud Light for all of YOUR meetings. Mike, thanks for your picks. A couple of things. First, we considered resume/body of work when we did our selections and seedings, and there is absolutely no way that the 97 KU team with Pierce/Lafrentz/Vaughn, who had one loss entering the NCAA Tourney, gets left out. They were on the verge of becoming an all-time legendary team had they gotten past the eventual champion Arizona. 2002 Duke was another great team that lost by one pt in the Sweets. Another tremendous body of work by that team. Moose – sorry, boss, but that Maryland team doesn’t stack up very well historically, even though they were a champ. The 98 Arizona team was essentially the same team that won in 97, and even though they lost in the E8s, they were completely loaded. But we only drink Guinness at our meetings, sorry. No ’89 Illinois? A bracketed #1 seed that lost in the Nat’l semis to a Michigan team they destroyed twice in the regaular season, most of their losses were without Kendall Gill. Definitely considered that team, but they didn’t make our cut. Sorry. The weird way in which Michigan won the title that year confounds that tournament a little bit. I was preparing my UCLA 1995 is underated but they seem to be getting the proper respect. Everyone thinks because of Tyus Edneys play against Mizzou that that team was not that good. But they won their last 17 games and were not really threatened in the tourney except for that one game. Sure UCONN and Arkansas were within striking distance but against Arkansas it was without Tyus and Tyus put the UCONN game in the bank at halftime. That team had coach of the year, player of the year and because of Todd Bozeman actually had only one official loss for that season.